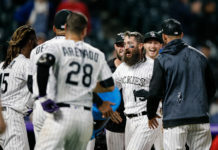 Colorado Rockies outfielder Corey Dickerson’s plantar fasciitis flared up on him as he ran the bases on a triple in the eighth inning of the first game of Wednesday’s doubleheader against the Arizona Diamondbacks. 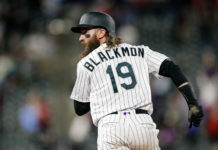 Rockies manager Walt Weiss took the left fielder out of the lineup for the second game after seeing him struggle to make his way around the bases. The absence was the first of the season for Dickerson and it isn’t clear if he will be forced to miss anymore time. The nagging injury is especially worrisome because it’s already the second time it’s flared up on Dickerson in the past three weeks. The first time was as the 25-year-old tried to run out of the batter’s box on April 20 against the San Diego Padres. Weiss held Dickerson out of the starting lineup the following day, but used him as a pinch hitter in the ninth inning. The injury originated toward the end of spring training. 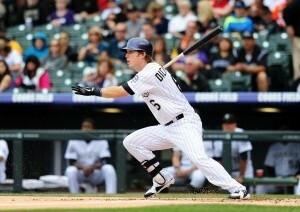 Dickerson is second on the Rockies with both 14 RBIs and five homeruns. The native of McComb, MS, is batting .290 on the season. Rafael Ynoa went hitless replacing Dickerson in left field on Wednesday night.